Kat Lombard-Cook, a participant in the upcoming inaugural Glasgow event of Laydeez Do Comics, writes about the group for TYCI. 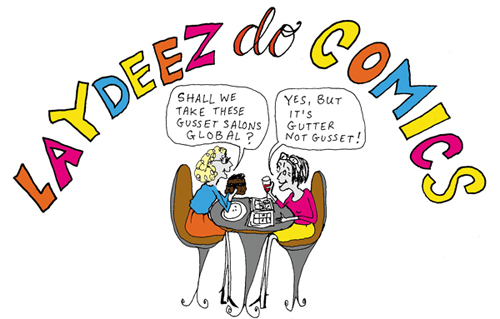 On Monday 10 February Laydeez Do Comics adds another city to its roster of much celebrated women-led comics forums. This time, the city happens to be our own Glasgow. Given Glasgow’s rich history of comics-making, having possibly given birth to the world’s first comic, it’s wonderful to have a new way to engage with the community, and have it celebrate and encourage women creators. LDC is part of a growing movement across comics to raise the profile of women in the industry, encourage inclusiveness, and encourage women and girls to become involved in comics. Groups like Women in Comics, Europe put women in touch with each other and the wider world, as well as provide a place for support and encouragement. One of the moderators of that group, Maura McHugh, collates and updates a list of women working in comics in Ireland and the UK. There are websites like Ladies Making Comics and the associated Women in Comics Wiki that aim to raise the profile of women creators. There are also any number of zines, collectives, and anthologies, both online and off, that are dedicated to women: Sequential Tart, Womanthology, The Bimba, The Strumpet, and local groups Hens Tae Watch Oot Fur and Team Girl Comic to name but a few. While LDC events are all run by women, the format is inclusive and has hosted a wide range of speakers — the main remit being to foster a conversation with a ‘focus on comic works based on life narrative, the drama of the domestic and the everyday’. There is a democratisation of production and content, with emerging artists sharing the same billing as long-time professionals, academics and bloggers. This openness encourages artists to present work that may still be in process, as well as finished work. Knowing that the audience comes with few pre-conceived notions makes the environment feel safer for artists to discuss struggles and roadblocks in their work. Personally, I am encouraged by this sort of breakdown of hierarchies within comics. Comics have been plagued with issues of legitimacy, courting ‘high art’ while trying not to be co-opted by galleries, and struggling to stay true to the medium’s working-class roots. The medium has been trying to shake off labels at every pass, so applying them within the community seems counter-productive at times. Everyone who works in comics, no matter what their involvement, is connected by a love of the medium and its ability to tell unique stories. This is what brings us together to discuss our particular projects. Glasgow’s first event features a diverse range of practitioners: myself, Kat Lombard-Cook, a practice-led PhD student; Neil Slorance, an illustrator whose recent work includes ‘The Amateur Astronomer’s Journal’ and ‘Dungeon Fun’, which is written by Colin Bell; and Morag Kewell, who surprised many who knew her for her sculpting talents, by creating the wonderful travelogue ‘Big in Japan’ in 2013. It makes a lot of sense for this kind of event to be happening in Glasgow, where there is a thriving independent comics scene. While the mainstream comic world may still be stacked in the favor of men, independent comics have been much more open to a diverse range of creators. This can be seen in discussions and panels like the Diversity in Comics Panel held at Thoughtbubble this past year, which was moderated by Louise Crosby of Leeds’ LDC. Glasgow has seen a rapidly growing enthusiasm for comics and graphic novels over the past few years… Laydeez Do Comics Glasgow has come at the right time, bringing a unique opportunity to the scene, particularly for those who are interested in indie / alternative comics and graphic novels. It’s a chance for people to share their enthusiasm, learn from each other’s experiences and be inspired. The friendly, laid-back atmosphere will also help people to meet like-minded people and network. Gill is also the creator and co-editor of Team Girl Comic. Through TGC, Gill has encouraged many women to begin publishing their comic work. Gill had started TGC when she felt a bit alone as a woman in Glasgow’s self-publishing world, and she has helped develop a thriving, growing network of women, Glaswegian creators. TGC itself produces four zines a year, and a weekly webcomic, but many women who started contributing to the zine now produce their own small press comics and webcomics. This year will see the 10th issue arrive, which I’m very much looking forward to. Glasgow also has an active academic engagement with comics. There was a one-off LDC held in the CCA last summer as part of the joint IBDS/Comics & Graphic Novel Conference that was held at Glasgow University. LDC founder Sarah Lightman received her PhD from Glasgow, and Lise Tannahill, another of LDC Glasgow’s organizing team, is currently working on her PhD there. A few more of us call Glasgow home, even if our research is tied to other universities. This mix should lead to some fascinating forums in the months to come. I am very proud to be part of the inaugural Monday 10 February at the Pearce Institute and I hope that this forum brings another method for engaging with the already rich and active comics community in Glasgow. Hope to see some of you there!